2. Check the weather. If temperatures are soaring, be prepared to shift gears from that fancy princess gown and heels, to a lightweight costume or Halloween-themed t-shirt paired with a themed light-up necklace instead. The kids may put up a fight, but in the end, they will be comfy and happy! 3. Get a head start. Although 7 p.m. is the official start time for the party, you can actually arrive as early as 4 p.m. with your special event ticket. Venture to favorite attractions, indulge in a yummy candy corn milkshake or ice cream cone, and be among the first inside the party to partake in Halloween fun. 4. Dance the night away. The new Storybook Circus Junior Jam dance party features Disney Junior stars like Vampirina and Doc McStuffins. Kids will love to rock out with their pals and burn off some energy! Guests are encouraged to purchase tickets for Mickey’s Not-So-Scary Halloween party in advance, as space each night is limited. (There is a savings of $10 per ticket when you purchase in advance for most nights!) For more information, visit https://disneyworld.disney.go.com/events-tours/magic-kingdom/mickeys-not-so-scary-halloween-party/ or call (407) WDISNEY (934-7639). This entry was posted in Disney, Disney World, Florida, Orlando, United States, Walt Disney World Resort and tagged Magic Kingdom, Mickey's Not So Scary Halloween Party on September 21, 2018 by siera. 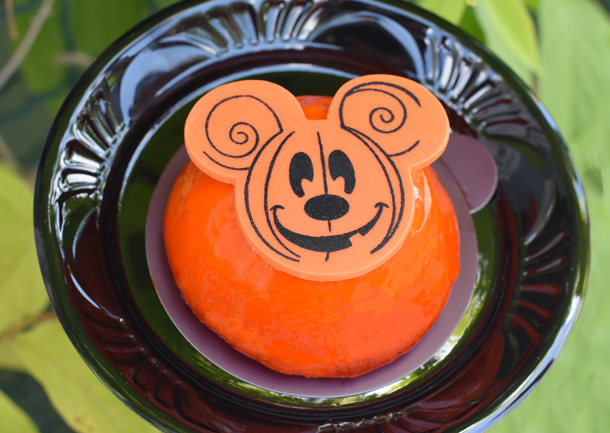 There are some SPOOKY treats appearing at Magic Kingdom Park for Mickey’s Not So Scary Halloween Party 2018, and ALL of the ghouls and ghosts are raving about them. What’s even more exciting is that the parties are now happening on select nights through October 31! So what are you waiting for? Here’s your list of all the treats you can find at this year’s Halloween celebration. 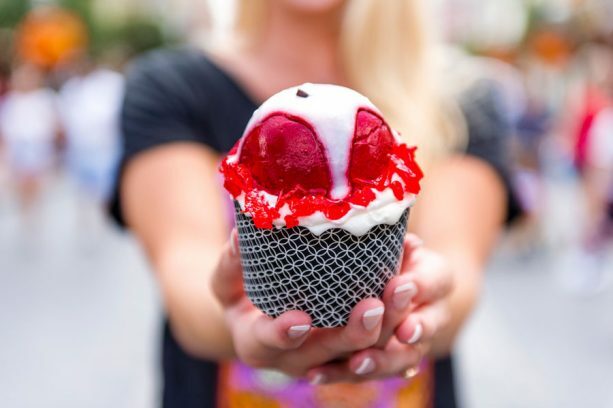 Magic mirror on the wall…show me the tastiest cupcake of them all! Snow White would definitely love to eat this spiced “apple” cupcake with pecan crunch and buttercream. 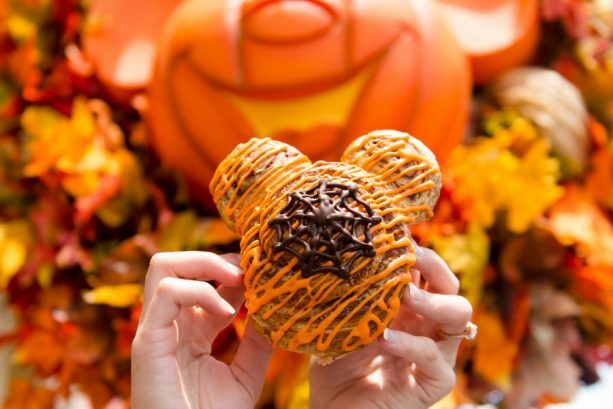 This deliciously spooky Mickey-shaped cinnamon roll is topped with icing and a chocolate spider web. 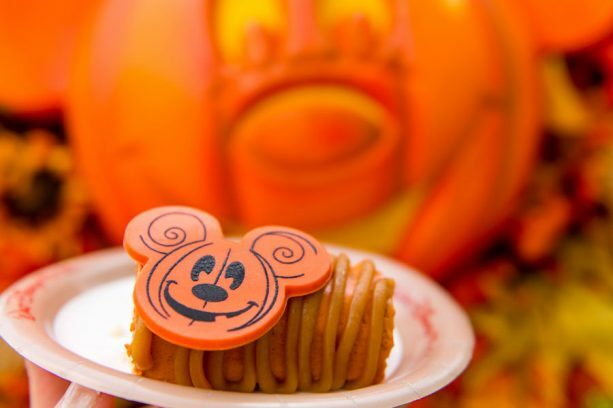 Topped with a chocolate Mickey Pumpkin, the gluten-friendly Pumpkin Cheesecake is sure to be a ghoulish delight with gluten-friendly vanilla pecan cake and caramel glaze. This decadent brownie just flew in to Casey’s Corner and is topped with a white chocolate piece featuring the one and only FABULOUS Minnie Mouse, dressed in her Halloween best! Turn up the heat with the Hades Nachos. 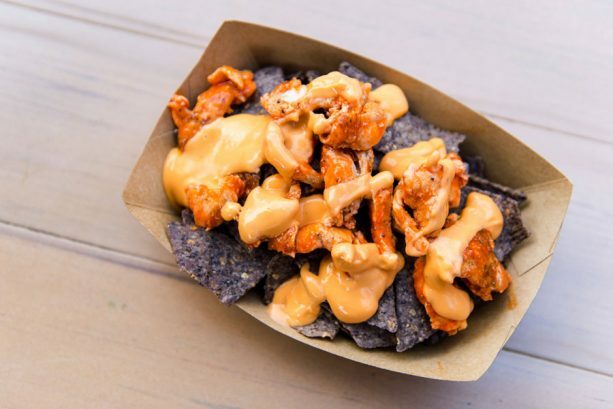 These black bean nacho chips are topped with fiery buffalo chicken and your choice of toppings from the topping bar! These gummy worms have been laid to rest. No mourning, please, at their request. 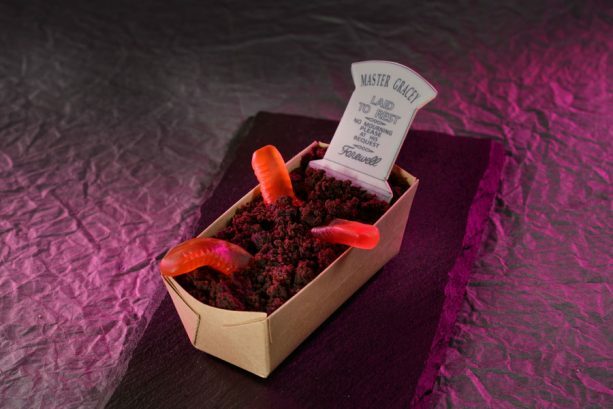 The Worms & Dirt chocolate pudding comes topped with gluten-friendly cake crumbs, gummy worms, and a chocolate grave stone. Nearby at the Cider House (Golden Oak Outpost), you’ll find some refreshing Apple Cider. 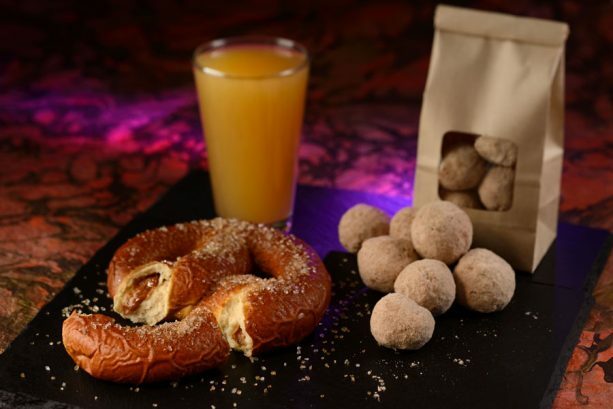 Pair it with a Warm Caramel-Stuffed Pretzel or a few Cinnamon Donuts and you’ve got yourself a frighteningly sweet snack! Everyone’s favorite ghostly good boy, Zero, has some special pumpkin waffles for you here at Sleepy Hollow. This sundae comes topped vanilla ice cream, sprinkles, and a caramel drizzle. If there is an empty place inside those bones, then you should fill it with the Jack Skellington Cake Push Pop. It comes layered with chocolate cake, vanilla buttercream, white chocolate and dark chocolate crispy pearls, dark chocolate curls, and a white chocolate Jack Skellington piece. Dear, sweet Leota, beloved by all. In regions beyond now, but having a ball-shaped dessert. You don’t need a fortune teller to see this sweet treat in your future! 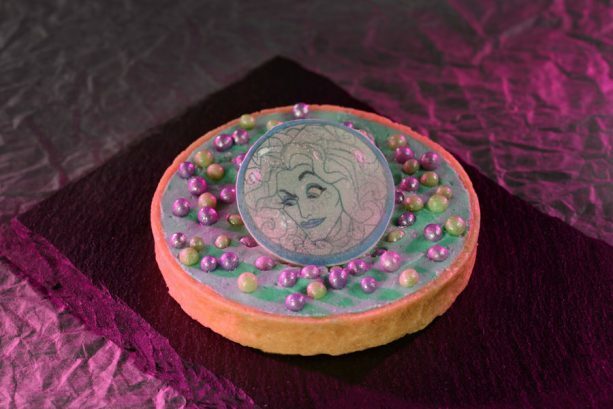 The Madame Leota Dessert has a vanilla tart shell filled with toasted marshmallow pastry crème and topped with crispy pearls, chocolate, and a hard candy garnish. These hungry ghosts have hitchhiked all the way to Adventureland – and they’ve brought this Doom Buggy-inspired Cream Puff with them! 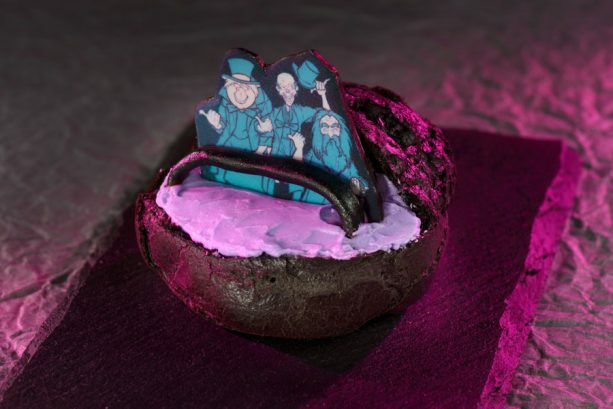 It’s filled with cookies and cream mousse and topped with a chocolate piece featuring the Hitchhiking Ghosts. You’re joking! You’re JOKING! This thing is gluten-friendly? 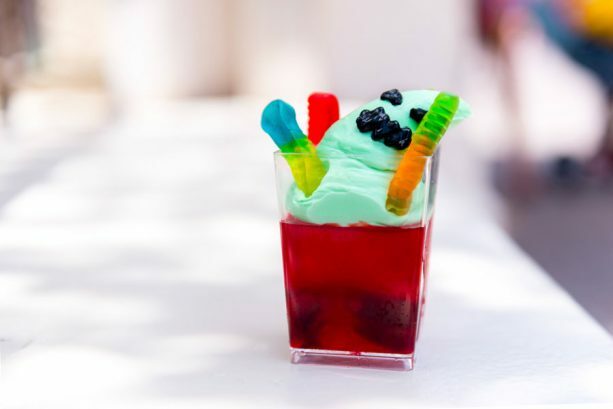 That’s right – this pomegranate-cherry gelée with gummy worms is topped with glow-in-the-dark meringue AND it’s gluten-friendly. How cool is that? LISTEN WELL – ALL OF YOU! The Maleficent Dessert has arrived at Storybook Treats! 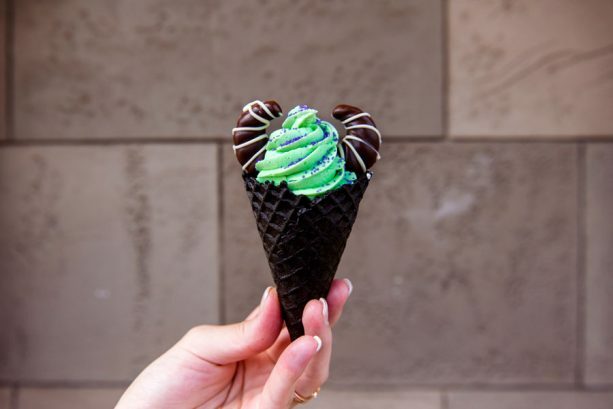 It comes with lime soft-serve in a black waffle cone and topped with purple sugar and chocolate horns. 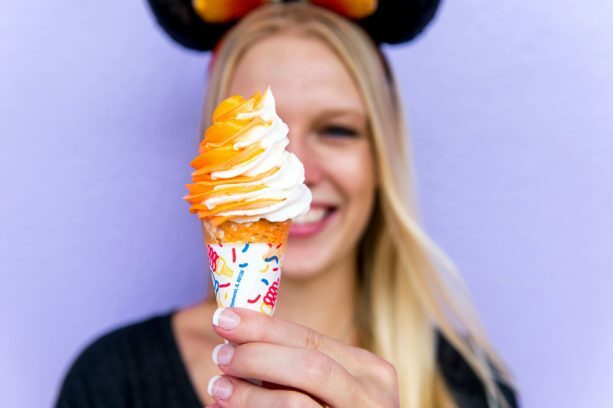 Satisfy that candy corn sweet tooth with this yummy soft-serve ice cream. Get it in a cone or in a sundae! We didn’t just stop at candy corn ice cream. This year we’ve created the Candy Corn Milkshake! The perfect Halloween treat – it’s topped with cotton candy and a Mickey-shaped marshmallow. 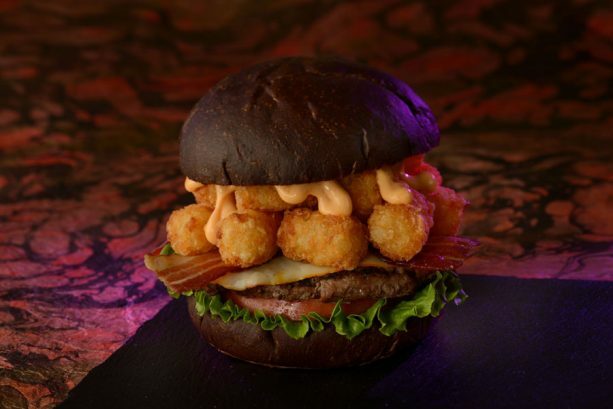 Feed that monstrous appetite with the Muenster Smash Burger served on a black bun with Muenster cheese, tots, and Sriracha aïoli. 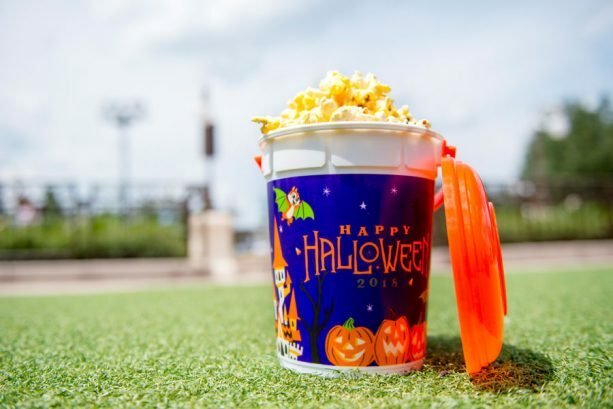 If you’re looking for those fun popcorn buckets, then check out my Novelty Guide to Halloween 2018 at Disney Parks for all the latest info and where to find them! 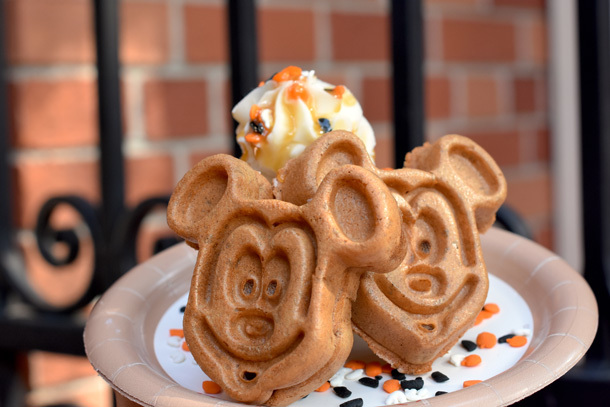 Remember, these treats are only available Mickey’s Not-So-Scary Halloween Party nights starting at 7pm (unless otherwise noted above). This special ticketed event occurs on select nights now through October 31. Also, note that some of these items may materialize in mobile order service on the MDX app! 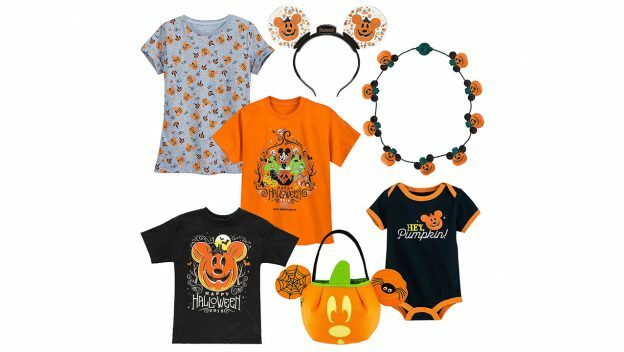 This entry was posted in Disney, Disney World, Florida, Orlando, United States, Walt Disney World Resort and tagged Mickey's Not So Scary Halloween Party on August 24, 2018 by siera. 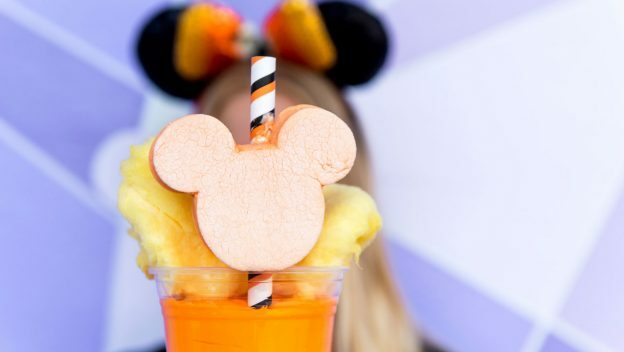 Calling all ghouls and ghosts who love Disney-themed food novelties – Halloween is almost here at Walt Disney World and Disneyland Resorts, and this year we’ve got a whole new set of novelty items for you to enjoy! Available at various times throughout the Halloween season, you never know when they will materialize … and remember – these popular novelties sell out fast, so be on the lookout and keep this guide to many of the Halloween 2018 souvenirs at Disney Parks handy during your search! First up is the Happy Halloween 2018 Base Popcorn Bucket –this year’s design features Mickey and Minnie all decked out in their Halloween best as well as Chip and Dale as adorable little bats! A similar design is featured on the Happy Halloween 2018 Base Travel Mug. The base popcorn bucket can be found at various popcorn locations across Disneyland park at Disneyland Resort and Magic Kingdom Park, Disney’s Animal Kingdom, Epcot, and Disney Springs at Walt Disney World Resort. The base travel mug will be available as a non-refillable mug available across Disneyland Resort, while the base travel mug at Walt Disney World Resort will be available as a refillable mug (only refillable for the duration of your stay) available at all resort hotels across property. Only available at Disney California Adventure park at Disneyland Resort is the Disney California Adventure Oogie Boogie Base Popcorn Bucket. Featuring everyone’s favorite villain from “Tim Burton’s The Nightmare Before Christmas” and even a familiar Headless Horseman, you’ll find this base popcorn bucket at the Buena Vista, Grizzly Peak, Pixar Pier, and Hyperion Popcorn Carts. 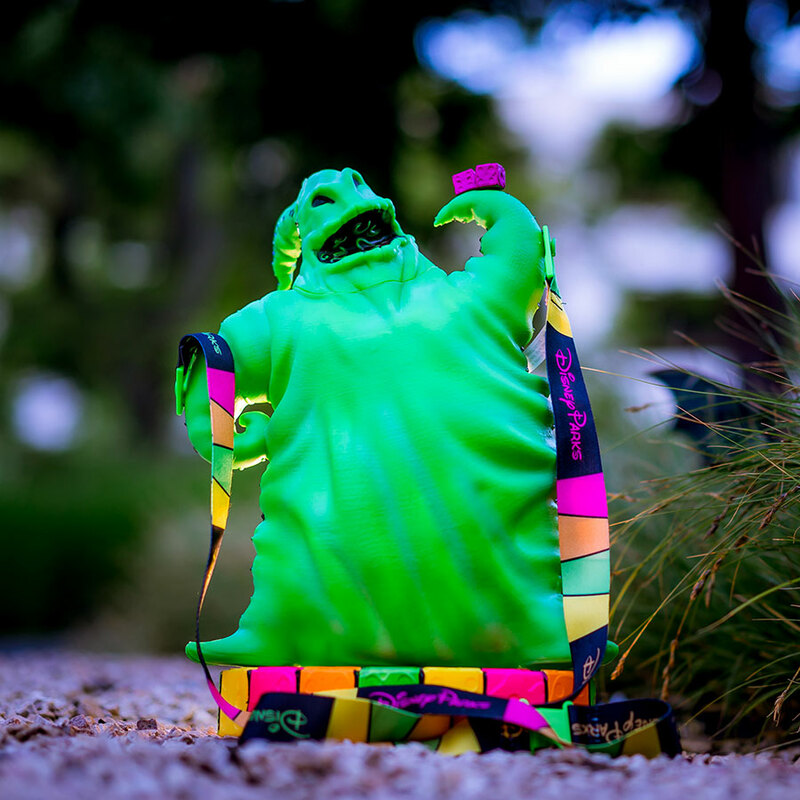 Do you remember last year’s Oogie Boogie Premium Popcorn Bucket? Well, I’ve got good news! This popular bucket is returning again this year to Disneyland Resort! Roll the dice with your popcorn-filled Oogie Boogie available at the Disney California Adventure park Popcorn Carts and at the New Orleans Popcorn Cart at Disneyland park. 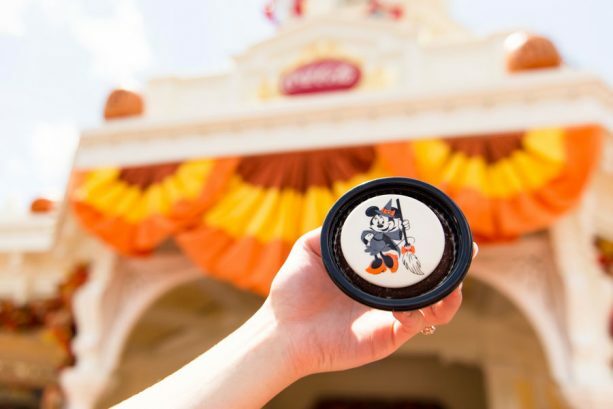 But that’s not all – a new version of this popular bucket will be available exclusively at Mickey’s Not-So-Scary Halloween Party at Magic Kingdom Park at Walt Disney World Resort – and later in the season at Disneyland Resort. 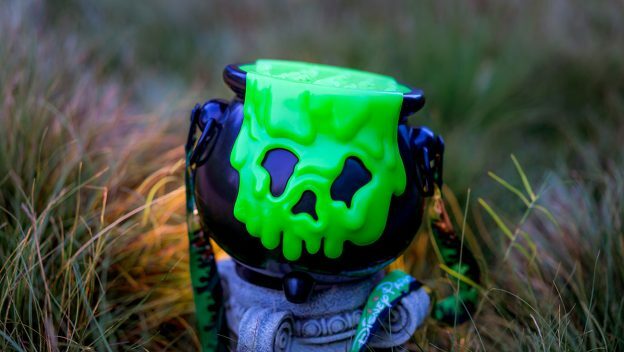 Double, double toil and trouble – get ready to cast some spells, brew a potion, and make that delicious popcorn disappear with the new Cauldron Premium Popcorn Bucket. Starting mid-September, this light-up bucket will be available at Disneyland park at Disneyland Resort and all four parks and Disney Springs at Walt Disney World Resort! And it even features a Hidden Mickey … but you’ll have to find that one on your own! 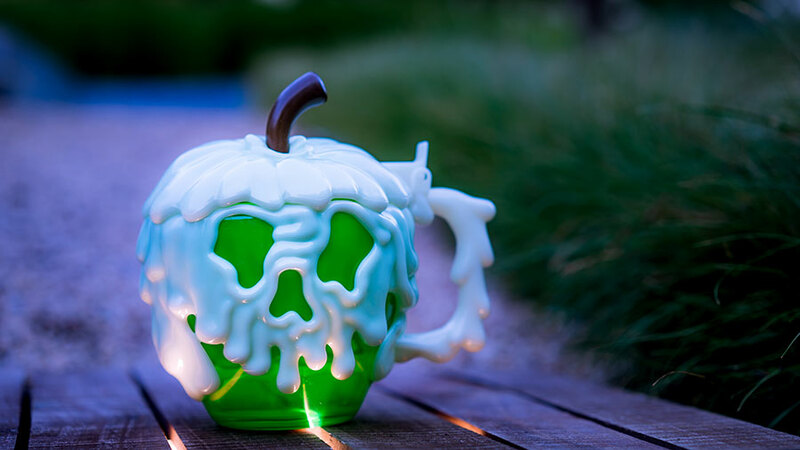 The Poison Apple Glow Cube is also back again this year in three different colors! 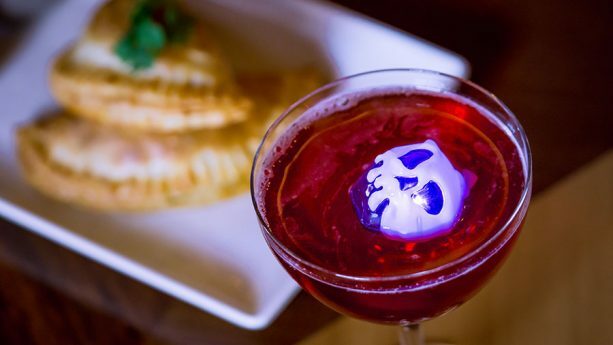 You’ll find this spooky light-up cube floating in specialty drinks on both coasts. At Walt Disney World Resort, get the Green Poison Apple Glow Cube at AbracadaBar at Disney’s BoardWalk or Jock Lindsey’s Hangar Bar at Disney Springs. At Disneyland Resort, you’ll find Green and Red Poison Apple Glow Cubes at various locations throughout Disneyland Resort. But there’s also a new color this year – a Purple Poison Apple Glow Cube! This one is available exclusively at Carthay Circle Restaurant at Disney California Adventure park. If the cube just isn’t enough, though, you can get the Green Poison Apple Stein! You’ll find it throughout Disneyland Resort as well as various outdoor vending locations throughout Disney’s Animal Kingdom at Walt Disney World Resort. 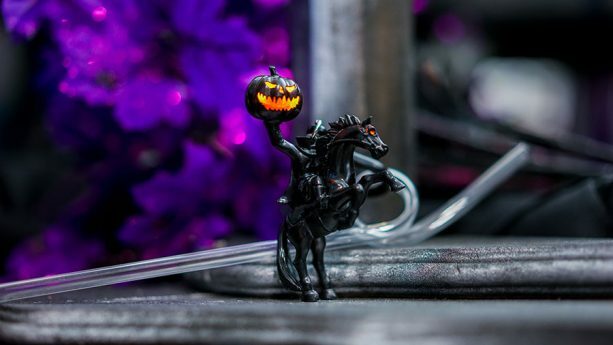 The Headless Horseman Straw Clip returns this year as well. You’ll find him galloping around at Magic Kingdom Park at Walt Disney World Resort and throughout the Disneyland Resort! 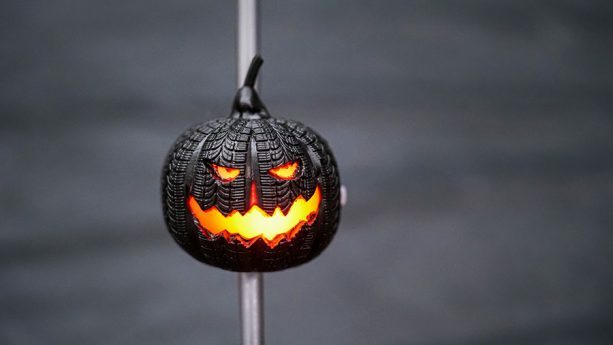 Get ready to burn rubber with the Tire Pumpkin Straw – the ultimate “Haul-o-ween” novelty. Inspired by Halloween at Cars Land, you’ll find this light-up straw at the Cozy Cone Motel and Flo’s V8 Café at Disney California Adventure park. And what’s more – they’ve driven on over to Walt Disney World Resort too! Find them at various quick-service locations throughout Epcot, Disney’s Hollywood Studios, and Disney’s Animal Kingdom Theme Park. Remember – these amazingly spooktacular Halloween novelties are quite popular and are only available while supplies last! 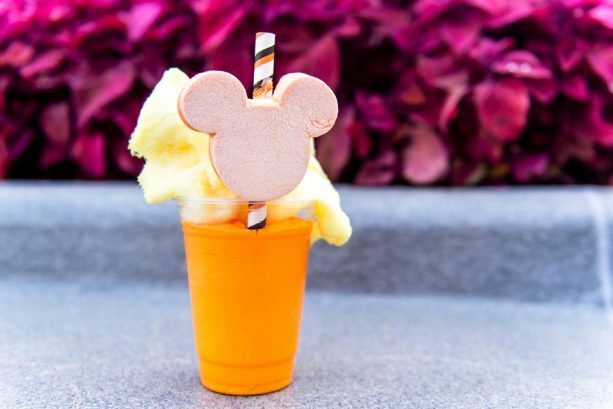 These novelty items will be available at various times throughout September and October at both Walt Disney World Resort and Disneyland Resort. Mickey’s Not-So-Scary Halloween Party at Magic Kingdom Park at Walt Disney World Resort begins August 17. Halloween Time at Disneyland Resort begins September 7. All of the novelty items listed above are only available for a limited time while supplies last. Prices are subject to change without notice. This entry was posted in Disney, Disney World, Florida, Orlando, United States, Walt Disney World Resort and tagged Disney World, Disneyland, Halloween, Halloween Time, Mickey's Not So Scary Halloween Party on August 17, 2018 by siera. Kick off fall with the ultimate fall into Disney magic vacation from September 3-8, 2018! You can enjoy a stay at one of the Walt Disney World Resort hotels and exclusive experiences planned just for you in all four parks! From a special dinner during the Epcot International Food & Wine Festival to exclusive time in the brand new Toy Story Land, this will be a vacation you won’t soon forget! The ultimate Fall into Disney Magic package starts at just $149 per person, per night, for a family of four in a Standard Room at Disney’s Caribbean Beach Resort, for a total package price of $2,980*. Book now through August 19, 2018―and get excited for a vacation packed with adventure and spook-tacular memories! This entry was posted in Disney, Disney World, Florida, Orlando, United States, Walt Disney World Resort and tagged Disney World, fall into Disney magic, Mickey's Not So Scary Halloween Party on July 20, 2018 by siera. There’s so much to enjoy at Mickey’s Not-So-Scary Halloween Party at Magic Kingdom Park – from characters in costume and complimentary treats, special shows, fireworks and more. Trick-Or-Treating! – Feeling like a kid again and being able to trick-or-treat right alongside our kids is so incredibly entertaining! Guests of all ages are welcome to do so at candy stops throughout Magic Kingdom Park on party nights. Be sure to pick up an event map on your way in to find your way to special treat stops. Disney Characters In Costume – Talk about fun photo opportunities! During Mickey’s Not-So-Scary Halloween Parties, many Disney characters are out and about in their Halloween best, ready to greet guests and pose for photos. 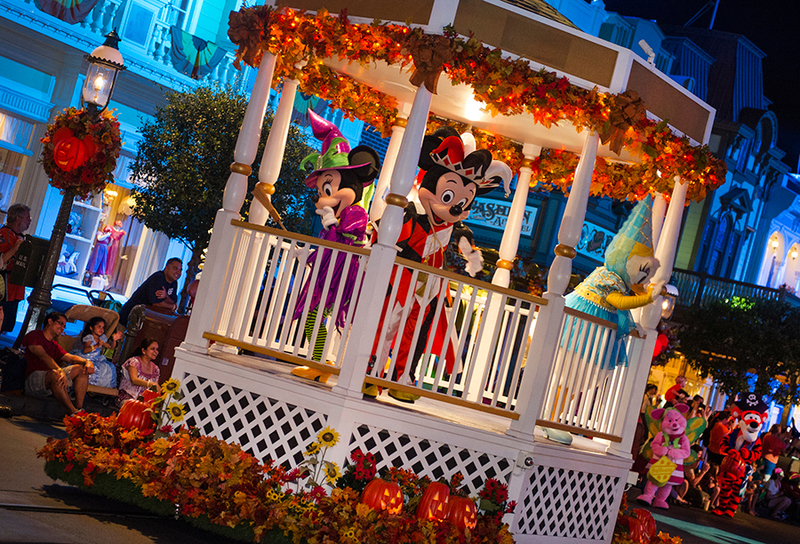 You can catch even more in “Mickey’s Boo-To-You Halloween Parade” at the event. Seeing the creative costumes our guests come up with is also a lot of fun. The “Hocus Pocus Villain Spelltacular” Stage Show – In this guest-favorite stage show, the Sanderson sisters – Winifred, Mary and Sarah – visit the mortal world for an all-new adventure, with a plan to use their magic to throw the best, evil Halloween party this side of the graveyard. You don’t want to miss the character appearances and fun musical numbers in this show. The “Mickey’s Boo To You Halloween Parade” – This spooktacular procession steps off twice each party night, led by an appearance from the Headless Horseman. Be on the lookout for an entire section of the parade inspired by residents of the Haunted Mansion, including marching butlers, waltzing spirits and the Hitchhiking Ghosts themselves! 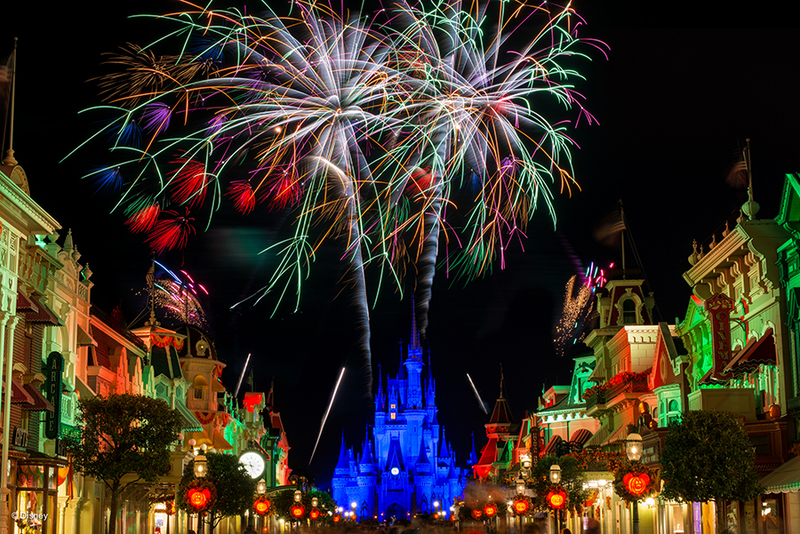 “Happy HalloWishes Fireworks” – Partygoers can’t miss the event’s special Halloween-themed fireworks spectacular. Narrated by the Ghost Host from The Haunted Mansion, the skies explode with color to the tunes of “Grim Grinning Ghosts,” “Poor Unfortunate Souls,” “Never Smile at a Crocodile,“ “The Skeleton Dance,” from Silly Symphony and more. What are your favorite reasons to attend Mickey’s Not So Scary Halloween Party 2017? This entry was posted in Disney, Disney World, Florida, Orlando, United States, Walt Disney World Resort and tagged Disney World, Magic Kingdom, Mickey's Not So Scary Halloween Party on October 6, 2017 by siera. Halloween kicks off early this year in Magic Kingdom Park, with Mickey’s Not So Scary Halloween Party 2017 on select evenings beginning August 25, fun-filled evening with trick-or-treating throughout the park, eerie entertainment and Disney characters that go bump in the night. Stop in the Main Street Bakery for a bright orange Mickey Halloween Cupcake with chocolate cake filled with purple marshmallow fluff topped with orange vanilla buttercream, sprinkles and a white chocolate scarecrow Mickey. 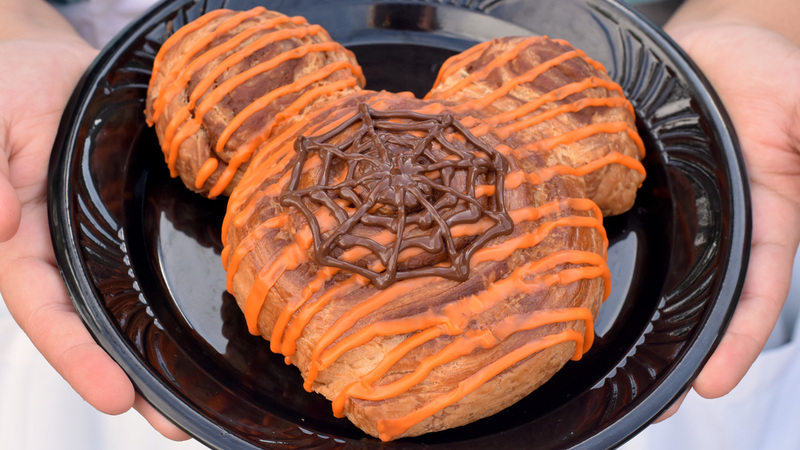 The Mickey-shaped Cinnamon Roll takes on a spooky twist with orange icing and a chocolate spider web. Plaza Ice Cream Parlor will scoop up pumpkin-flavored ice cream. Pumpkin Cheesecake Dome with a graham cracker streusel base, orange white chocolate glaze and a white chocolate Mickey can be found at Main Street Bakery and Gaston’s Tavern. 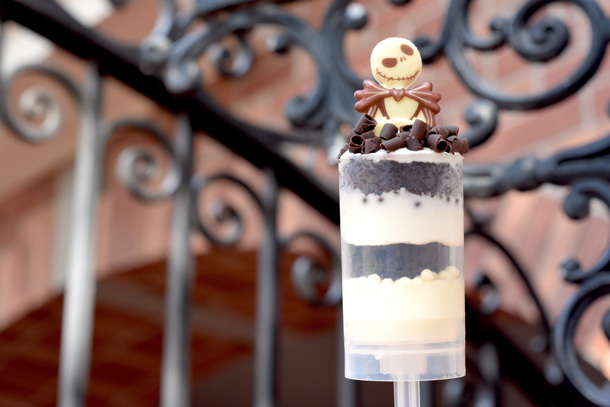 Jack Skellington gets his own dessert at Sleepy Hollow in Liberty Square – a vanilla panna cotta, chocolate cake, vanilla buttercream, white chocolate and dark chocolate crisp pearls, dark chocolate curls and a white chocolate Jack Skellington. Aloha Isle – chocolate tart filled with chocolate ganache and topped with Oreo panna cotta and a white chocolate Haunted Mansion-inspired portrait. 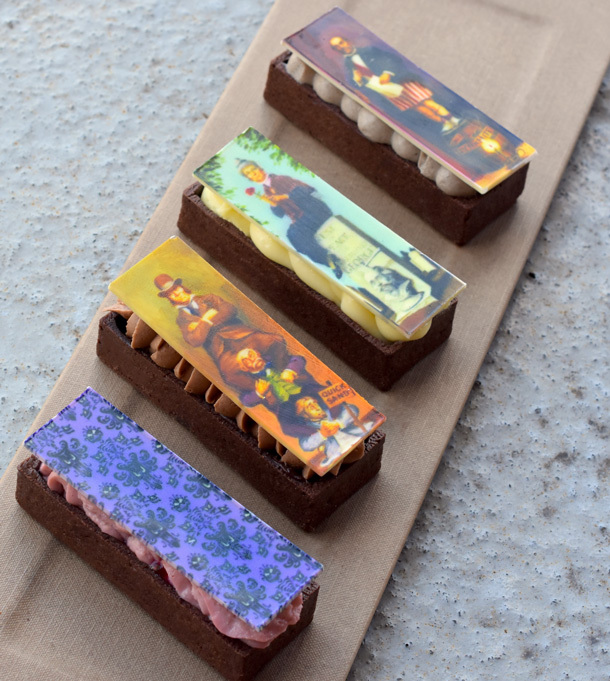 Auntie Gravity’s Galactic Goodies – chocolate tart filled with raspberry compote and topped with white chocolate mousse and a Haunted Mansion-inspired white chocolate portrait. Liberty Square Market – chocolate tart filled with chocolate ganache and topped with peanut butter icing and a Haunted Mansion-inspired white chocolate portrait. Storybook Treats – chocolate tart filled with lemon curd, strawberry compote and topped with strawberry mousse and a Haunted Mansion-inspired white chocolate portrait. 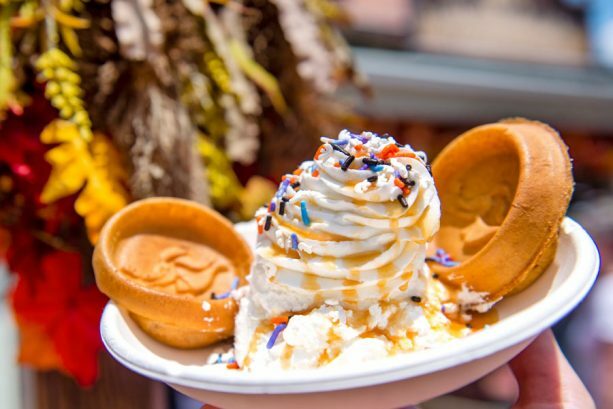 A Pumpkin Mickey Waffle with vanilla ice cream, whipped cream, sprinkles and caramel sauce will be offered at Sleepy Hollow. 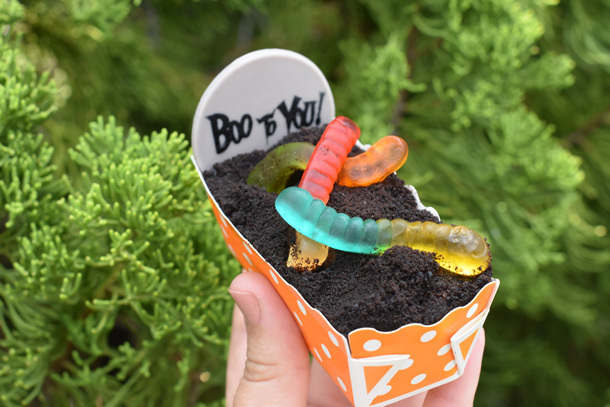 Pecos Bill Tall Tale Inn and Café will offer Worms and Dirt, a chocolate gravestone with chocolate cake and chocolate mousse with a chocolate glaze topped with Oreo crumbs, and gummy candy. Auntie Gravity’s Galactic Goodies in Tomorrowland will dish up Candy Corn Ice Cream. 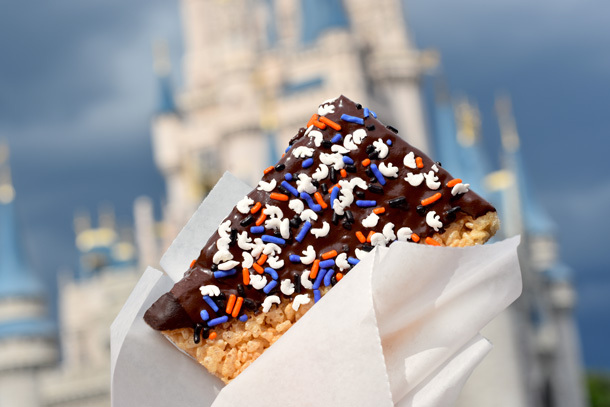 Grab Chocolate Crisped Rice Treats and Vampire Mickey Brownies at various outdoor vending and kiosks throughout the Magic Kingdom Park. For tickets, party details and official costume rules, click here. Mickey’s Not So Scary Halloween Party 2017 dates are August 25 and 29; September 1, 7, 10, 12, 15, 17, 19, 22, 24, 26 and 29; October 1, 3, 5, 6, 9, 10, 12, 13, 15, 17, 19, 20, 22, 24, 26, 27, 29 and 31, and November 1. This entry was posted in Disney, Disney World, Florida, Orlando, United States, Walt Disney World Resort and tagged Disney World, Halloween, Magic Kingdom, Mickey's Not So Scary Halloween Party, Walt Disney World on August 25, 2017 by siera. 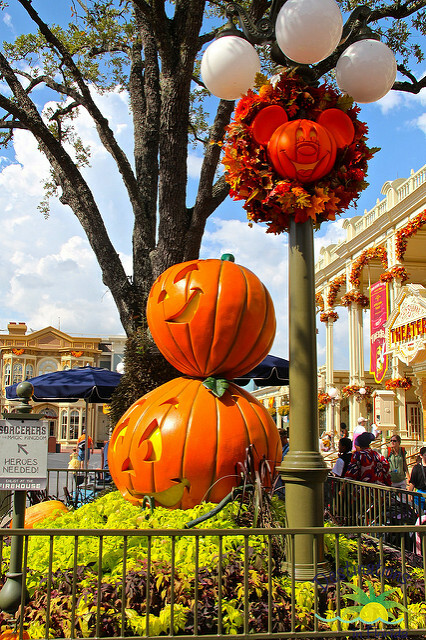 Fall is an exciting time at the Walt Disney World Resort. 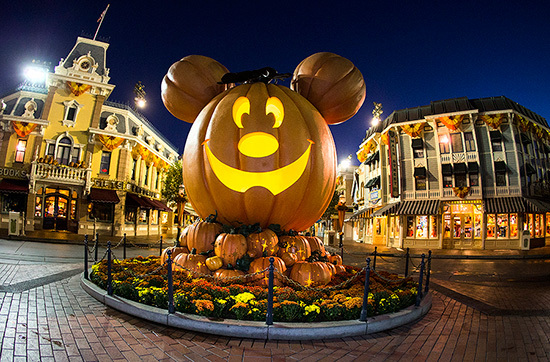 Mickey’s Not So Scary Halloween Party is held on select nights in September, October, and November. 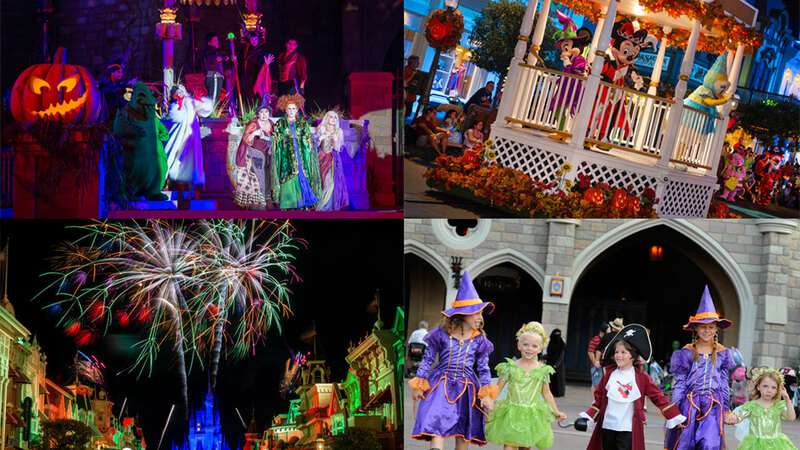 These special event parties at the Magic Kingdom are the perfect way to help your family get into the fall spirit. If you’re planning to attend Mickey’s Not So Scary Halloween Party this year, here are some tips for Mickey’s Not So Scary Halloween Party so you can make the most of your evening. Purchase Your Special Event Ticket Early– Admission to Mickey’s Not So Scary Halloween Party is not included with general the park admission. You must purchase a separate Mickey’s Not-So-Scary Halloween Party ticket. There are two perks to buying your tickets in advance- you may receive a discount on select event nights and some nights will sell out so you won’t have to worry about missing out! Wear a costume– Kids of all ages are welcome and encouraged to wear costumes to the party. 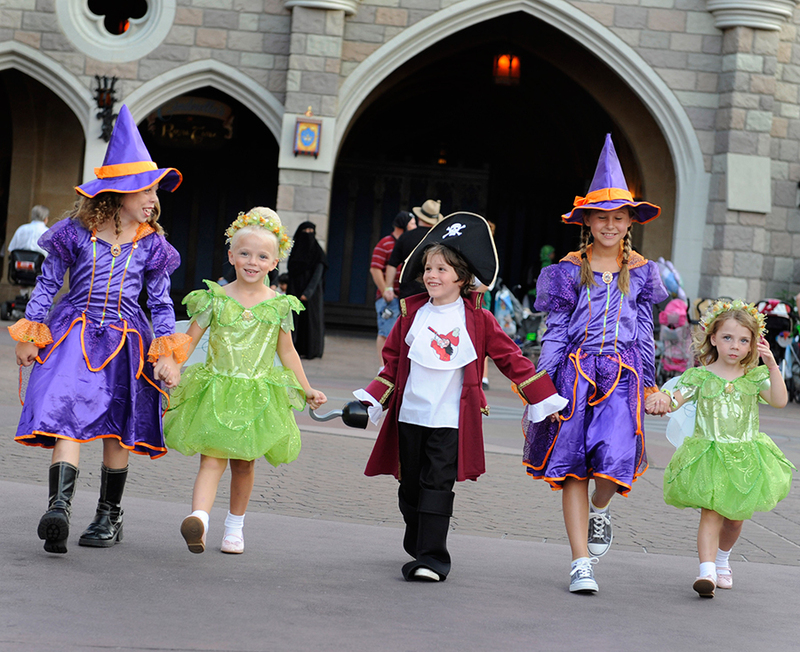 It doesn’t matter if your costume is extravagant or homemade, dressing will help to put you in the Halloween spirit and make for cute photos with Disney characters – who also will also be wearing their Halloween best! Pick Up a Special Event Map– The best way to make sure that you don’t miss anything is by grabbing an event map on your way in to the party. These maps will show you where to find trick-or-treat stations and special character greetings and even list the times for must-see Halloween entertainment. 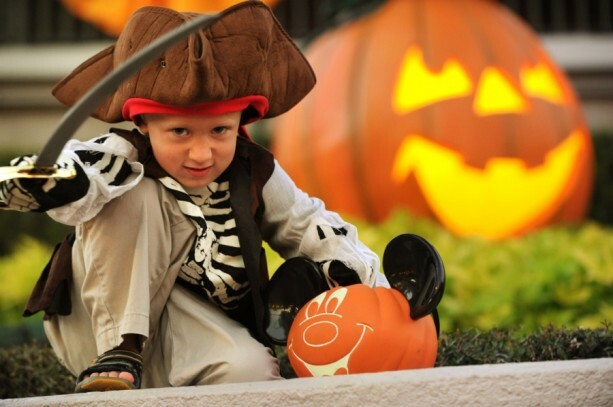 Try Trick-Or-Treat Stations– All guests at the party (regardless of age) are welcome to trick-or-treat throughout the park at designated treat stations and special treat trails – pathways that offer multiple candy stops along the way. Plus, you can pick up a complimentary trick-or-treat bag on your way into the park to help you carry all your treats. Watch Mickey’s “Boo-to-You” Halloween Parade– Any Disney parade is amazing, but if you’d like to see some of your favorite characters in Halloween costumes, marching Haunted Mansion butlers, dancing hitchhiking ghosts, Goofy’s giant candy machine, and more, you won’t want to miss Mickey’s “Boo-To-You” Halloween Parade! Don’t Miss “Happy HalloWishes” Fireworks– One of the highlights of the parties is the special Halloween-themed fireworks show that takes place every night. 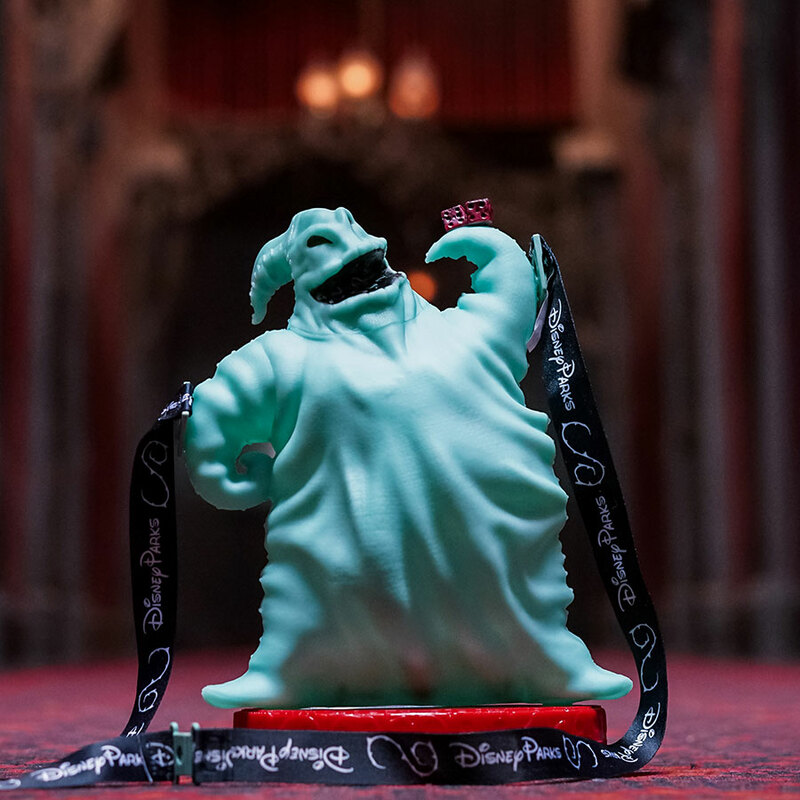 “Happy HalloWishes” is narrated by the Ghost Host from The Haunted Mansion and features sections inspired by Cruella de Vil, Jafar, Oogie Boogie, and other Disney villains. 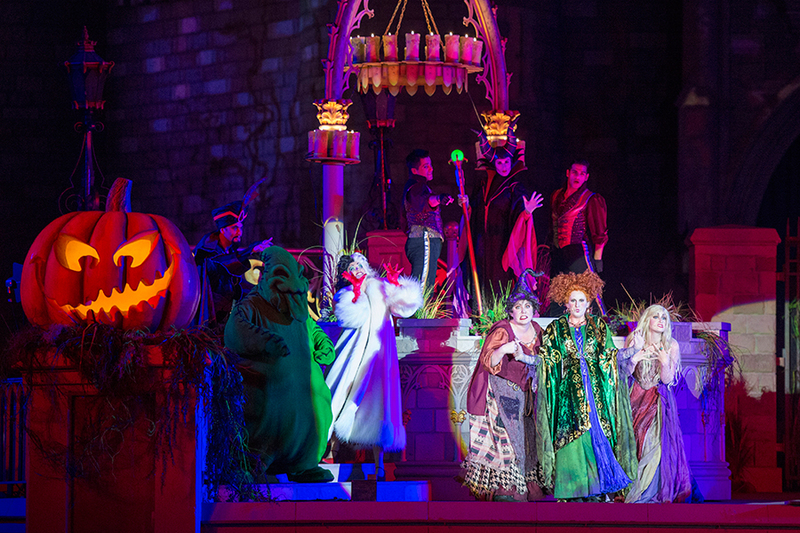 Do you have a tip for attending Mickey’s Not-So-Scary Halloween Party? You can check out the full guide to Mickey’s Not So Scary Halloween Party here. You can learn more about the treat, entertainment, and merchandise options at the party. Siera is a Disney travel specialist and would love to help you plan your next Disney World vacation at no cost to you. 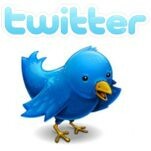 Request your free, no obligation quote on the right side of the page or email spreadingmagic@gmail.com. This entry was posted in Disney and tagged Boo to You Parade, Halloween, HalloWishes, Mickey's Not So Scary Halloween Party on September 2, 2014 by siera. Free Dining– Everyone’s favorite discount, free dining, is available for stays during the entire month of September 2014! This offer is about to expire, but you can still take advantage of free dining through 11:59 pm on August 8, 2014. Frozen Summer Fun– The coolest event of the summer, Frozen Summer Fun, at Disney’s Hollywood Studios has officially been extended through September 28, 2014. You can view the Royal Processional, sing a long with Anna and Elsa, explore Wandering Oaken’s Trading Post, and watch Frozen Fireworks. 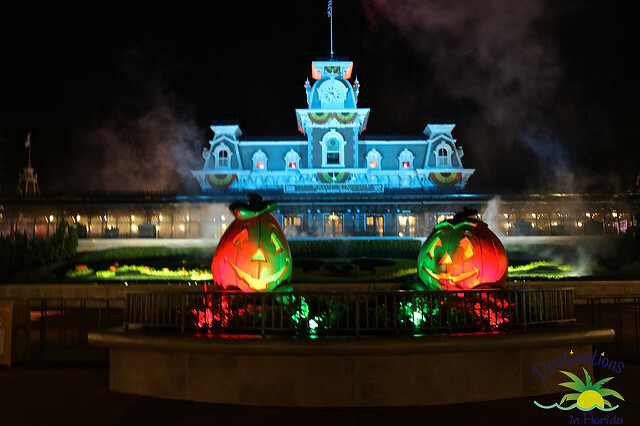 Mickey’s Not So Scary Halloween Party– Mickey’s Not So Scary Halloween Party is held on select nights in Magic Kingdom Park. This year, the parties begin a little earlier than usual on September 1st! You have even longer this year to enjoy the Boo to You Parade, HalloWishes, and trick or treating throughout the Magic Kingdom! Epcot International Food and Wine Festival– This annual festival also begins a little early this year to give you more time to enjoy food and beverages from around the world! Beginning September 19, you can sample items from all over the world, rock out at a free concert series, and learn more about the culinary world at demonstrations, seminars, and talks. Night of Joy- This two-night contemporary Christian music festival will be held at Magic Kingdom on September 5-6, 2014 from 7:30 pm to 1:00 am! You can purchase tickets for either Friday night or Saturday night or both nights at a discount! 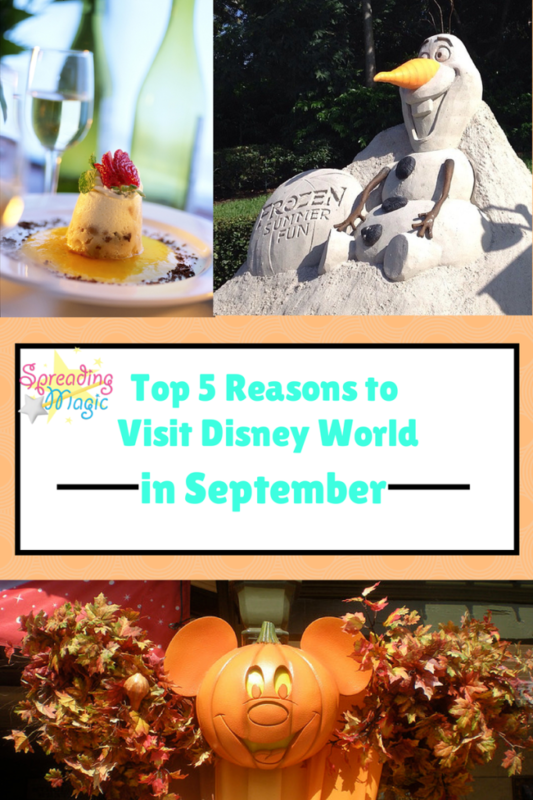 Are you planning to visit Disney World in September 2014? 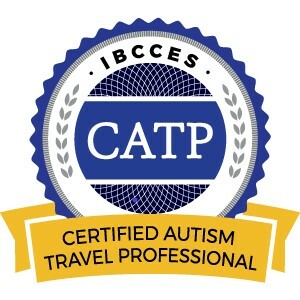 It’s not too late to starting planning your trip! Plus, we can help arrange all the details so all you have to do is enjoy it! Request your free, no obligation quote on the right side of the page or email siera@destinationsinflorida.com for more information! This entry was posted in Disney and tagged Epcot International Food and Wine Festival, free dining, Frozen Summer Fun, Mickey's Not So Scary Halloween Party, Night of Joy on August 7, 2014 by siera. There are always exciting events happening year-round at the Walt Disney World Resort in Florida. If you are visiting between September and December, there are special parties at Magic Kingdom on select nights. On select nights in September and October, you can enjoy Mickey’s Not So Scary Halloween Party while Mickey’s Very Merry Christmas Party will be held on select nights in November and December. Tickets are now available to both Mickey’s Not So Scary Halloween Party 2014 as well as Mickey’s Very Merry Christmas Party 2014. In case you have never attended one of the special parties at Magic Kingdom before, Mickey’s Not-So-Scary Halloween Party is a hard-ticket event that allows you to enjoy Magic Kingdom Park attractions, special Halloween-themed entertainment (parade and fireworks), the Disney Villains Mix & Mingle stage show, special character meet and greets, trick-or-treating throughout the park and much more! Mickey’s Not-So-Scary Halloween Parties will be held from 7 p.m.-midnight on September 1, 9, 12, 14, 16, 19, 21, 23, 26 and 28, and October 2, 3, 5, 9, 10, 13, 16, 17, 19, 21, 23, 24, 26, 28, 30 and 31 in 2014. Ticket prices vary depending on the night selected. 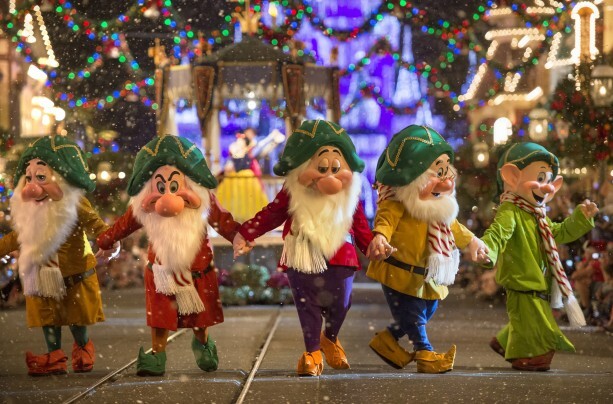 Mickey’s Very Merry Christmas Parties are full of holiday cheer throughout November and December. The parties feature lights on Cinderella Castle along with other amazing holiday decor, a special holiday parade and fireworks, exclusive entertainment, Santa Claus sightings and more. This year’s parties will be held on November 7, 10, 13, 14, 16, 20, 21 and 30, and December 2, 4, 5, 7, 9, 11, 12, 14, 16, 18 and 19. Ticket prices for this event can also vary depending on the date you are attending. Entrance to either party requires a separate ticket (in addition to your park ticket or pass). Advance purchase is strongly recommended. Plus, don’t forget free dining is still available for select dates this fall and winter! This entry was posted in Disney and tagged Disney World Special Events, Mickey's Not So Scary Halloween Party, Mickey's Very Merry Christmas Party on June 29, 2014 by siera.